Allergies are the consequence of an overreaction by your immune system against specific substances such as pollen, house dust mites, moulds or animal dander. These are substances that are normally tolerated by individuals but in someone with an allergy, they can cause medical problems. Medical problems with an allergic component include hay fever (allergic rhinitis), asthma and allergic conjunctivitis. 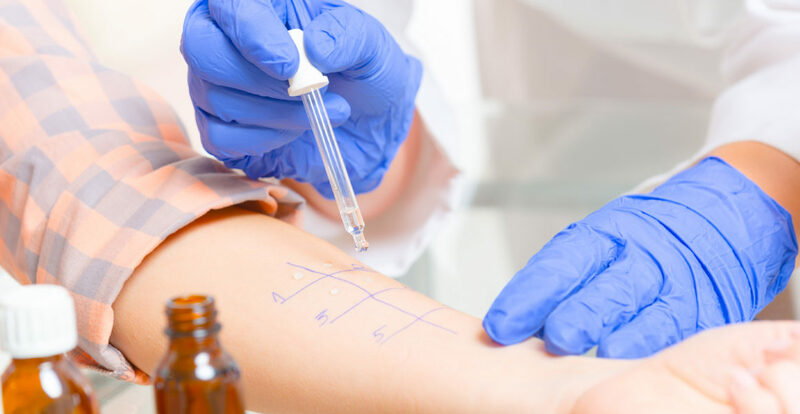 Our clinic offers skin prick allergy testing to help diagnose our patients suffering from allergies including allergic rhinitis. In most cases, once an allergen is diagnosed, treatment can commence. Skin prick testing is when a commercially formulated drop of each allergen is placed on the skin to identify if there is a reaction. If an allergy is present, a wheal and flare reaction (similar to a mosquito bite) will occur. What allergies do we test for in our clinic? Using our skin prick tests, we are able to look for reactions to house dust mites, pollen, grasses, moulds and animals including cats and insects. Our patients may be suffering from symptoms such as watery, puffy, itchy eyes, itchy nose or throat, nasal congestion (blocked nose) or sneezing fits. Why would I want an allergy test? Managing allergy related problems often starts with testing for and finding the trigger allergen. By identifying the allergen, strategies can be put in place to manage the problem. This may be as simple as avoiding and reducing your exposure to what you are found to be allergic to or it could involve allergen immunotherapy (AIT). Allergen immunotherapy is the only known treatment that alters the immune response which treats the cause of the allergy instead of the symptoms. This treatment has been proven to be effective for patients that suffer from moderate to severe allergic rhinitis. Once the allergy is identified through the skin prick test, AIT can commence by the administration of increasing doses of the allergen extracts that are prescribed according to your own allergy pattern. This is the closest thing we have to a cure for allergies.